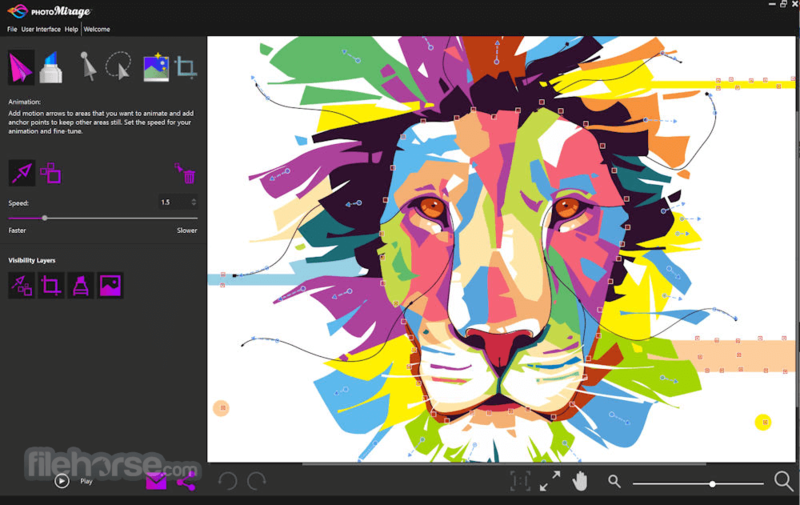 Create mesmerizing photo animations in minutes. Simply uncomplicated! With Corel PhotoMirage you can transform any image into a captivating animation in three simple steps! Whether you want to boost social engagement, drive results on the web, or simply have fun with photos, PhotoMirage™ is your key to creating attention-grabbing photo animations that engage, inspire and transfix. Drag and drop Motion Arrows over the parts of the image you want to move. Plot Anchor Points around the areas you want to keep still. Hit Play to watch your image transform into a looping animation, then save or share! 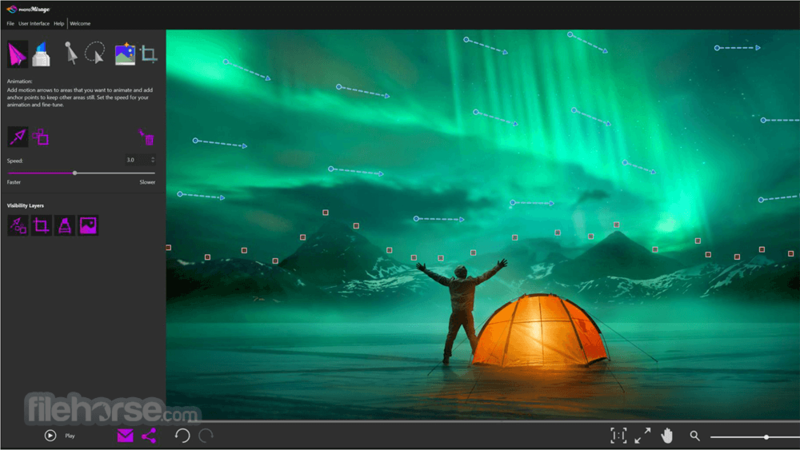 Click, drag and drop Motion Arrows in the direction you want your image to move. Plot Anchor Points around the areas you want to keep still. Adjust desired speed with an easy slider control, then bring it altogether with a preview to watch your photo come to life! Moving images have viral appeal. Not only do they engage an audience’s emotions, but they also spark intrigue. They are like an illusion—not quite a photo and not quite a video. Corel PhotoMirage for PC is the extraordinary tool that helps you break through the visual clutter. It’s easy to create scroll-stopping, share-worthy photo animations that will capture and hold the attention of viewers, and advance your social media game. Get noticed in a whole new way! Use the hypnotic appeal of photo animation to remedy decreasing attention spans and an overabundance of static visual content. PhotoMirage provides a refreshing way to attract attention in a competitive digital landscape. Use PhotoMirage to create an original animated background for your website or blog, and watch your conversions grow. Get lost in the process of creating the perfect animation using one of your favorite photos. Crop, mask, and enhance your image before adding movement. Experiment, refine and perfect your artwork until you have a seamless looping animation. Share your photo animations with family, friends and the world! It's easy to export for various social and sharing platforms including Instagram, YouTube, Facebook, Vimeo, Flickr, Twitter, Pinterest, Snapchat, Google Photo and SmugMug. Plus, you can also share through email and to the PhotoMirage user gallery. Choose the Custom export option to control size, animation duration, quality, and more. Start with a JPEG, GIF, PNG, BMP, TIFF, or RAW photo, and finish with a WMV, MP4 or GIF. 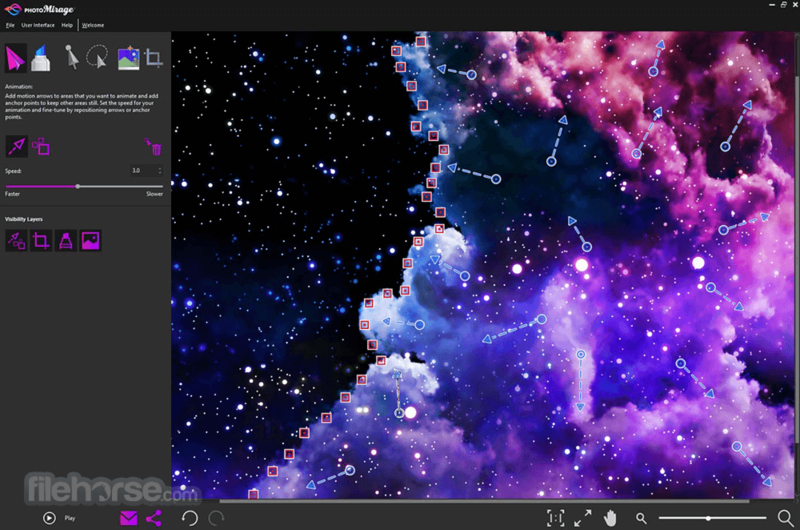 PhotoMirage supports a broad selection of input formats making it easy to animate any photo. Choose from popular video and image file types when saving, so your photo animation plays nearly anywhere. Enjoy a smooth finished product with 60 frames per second output, and ultra high definition resolution with support for 4K. Getting started with PhotoMirage is quick and easy—and becoming an expert is too! Launch your application and be instantly greeted by the Welcome Guide, packed with helpful video tutorials and other learning content. Or, if you want to create right away, simply drag and drop your image into PhotoMirage's workspace and you're ready to go.